Alzheimer’s Disease (AD), affecting a large population worldwide is characterized by the loss of memory and learning ability in the old population. The enzyme Acetylcholinesterase Enzyme (AChE) is the key enzyme in the hydrolysis of the neurotransmitter acetylcholine and is also the target of most of the clinically used drugs for the treatment of AD but these drugs provide only symptomatic treatment and have the limitation of loss of therapeutic efficacy with time. The development of different strategies targeting the AChE enzyme along with other targets like Butyl Cholinesterase (BChE), amyloid-β (Aβ), β-secretase-1 (BACE), metals antioxidant properties and free radical scavenging capacity has been focused in recent years. Literature search was conducted for the molecules and their rational design which have shown inhibition for AChE and the other abovementioned targets. Several hybrid molecules incorporating the main sub-structures derived from diverse chemotypes like acridine, quinoline, carbamates, and other heterocyclic analogs have shown desired pharmacological activity with a good profile in a single molecule. It is followed by optimization of the activity through structural modifications guided by structure-activity relationship studies. It has led to the discovery of novel molecules 17b, 20, and 23 with desired AChE inhibition along with desirable activity against other abovementioned targets for further pre-clinical studies. Keywords: Alzheimer's disease, Acetylcholinesterase, Molecular hybridization, Multi-target-directed ligands, Amyloid-β- peptides, Target enzyme. Keywords:Alzheimer's disease, Acetylcholinesterase, Molecular hybridization, Multi-target-directed ligands, Amyloid-β- peptides, Target enzyme. Abstract:Alzheimer’s Disease (AD), affecting a large population worldwide is characterized by the loss of memory and learning ability in the old population. The enzyme Acetylcholinesterase Enzyme (AChE) is the key enzyme in the hydrolysis of the neurotransmitter acetylcholine and is also the target of most of the clinically used drugs for the treatment of AD but these drugs provide only symptomatic treatment and have the limitation of loss of therapeutic efficacy with time. The development of different strategies targeting the AChE enzyme along with other targets like Butyl Cholinesterase (BChE), amyloid-β (Aβ), β-secretase-1 (BACE), metals antioxidant properties and free radical scavenging capacity has been focused in recent years. 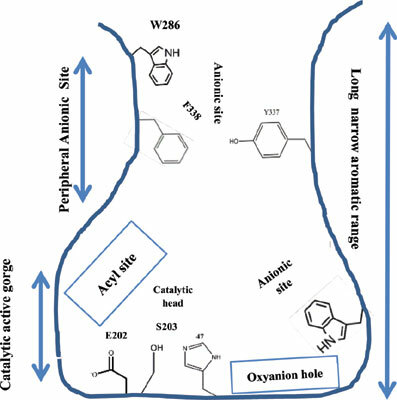 Literature search was conducted for the molecules and their rational design which have shown inhibition for AChE and the other abovementioned targets. Several hybrid molecules incorporating the main sub-structures derived from diverse chemotypes like acridine, quinoline, carbamates, and other heterocyclic analogs have shown desired pharmacological activity with a good profile in a single molecule. It is followed by optimization of the activity through structural modifications guided by structure-activity relationship studies. It has led to the discovery of novel molecules 17b, 20, and 23 with desired AChE inhibition along with desirable activity against other abovementioned targets for further pre-clinical studies.